Carbon nanotubes (CNTs) were deposited on various substrates namely untreated silicon and quartz, Fe-deposited silicon and quartz, HF-treated silicon, silicon nitride-deposited silicon, copper foil, and stainless steel mesh using thermal chemical vapor deposition technique. The optimum parameters for the growth and the microstructure of the synthesized CNTs on these substrates are described. The results show that the growth of CNTs is strongly influenced by the substrate used. Vertically aligned multi-walled CNTs were found on quartz, Fe-deposited silicon and quartz, untreated silicon, and on silicon nitride-deposited silicon substrates. On the other hand, spaghetti-type growth was observed on stainless steel mesh, and no CNT growth was observed on HF-treated silicon and copper. Silicon nitride-deposited silicon substrate proved to be a promising substrate for long vertically aligned CNTs of length 110–130 μm. We present a possible growth mechanism for vertically aligned and spaghetti-type growth of CNTs based on these results. Over the last several years, a large number of experiments have been carried out to study the growth and structure of carbon nanotubes (CNTs) and to correlate the results with theoretical predictions [1–3]. Owing to wide applications of CNTs in nano electronics, energy storage devices, optics, medical, and many others fields, an intense research is being carried out to find substrate and CNT combinations that can directly act as active/passive components of devices in specific applications [4, 5]. Along with silicon, many other substrates such as glass, nickel, sapphire, quartz, and alumina have been explored in this direction [3–10]. Further, the role of various catalysts such as Fe, Co, and Ni has also been extensively explored in conjunction with these substrates. It has been demonstrated that the morphology and microstructure of CNTs depend on the substrate, precursors, and the catalyst used [3, 11]. It is also possible that a substrate suitable for optimized growth of CNTs may itself be a serious limitation for a particular application. Dielectrics such as silicon oxide and silicon nitride, which have good compatibility with silicon, have shown promise as substrates for the growth of CNTs. Silicon nitride-deposited silicon substrate has an edge over silicon oxide-deposited silicon owing to its high dielectric constant that can overcome the limitation of device shrinkage imposed by Moore’s law. In this paper, we present a comparative study on the growth and morphology of CNTs synthesized by thermal chemical vapor deposition on various substrates commonly used in various applications. The following substrates were used for the growth of CNTs in the present study : (1) untreated silicon, quartz, silicon oxide, copper, and stainless steel, (2) n-type silicon and quartz with an iron film of ~20 nm thickness deposited on them by thermal evaporation (3) n-type silicon wafer with a ~20-nm film of amorphous hydrogenated silicon nitride (a-SiN x :H) deposited on it by photo-enhanced CVD, and (4) n-type silicon with HF treatment. Further, the (2) and (3) categories of substrates (Fe and silicon nitride-deposited silicon) were heat-treated in air at 900°C for 20 min in a CVD chamber prior to growing CNTs on them. The experimental setup used for the growth of CNTs by thermal CVD has been described elsewhere [12, 13]. Each substrate was placed in a quartz boat and then loaded into a quartz reaction tube (growth chamber) of a horizontal single-stage tubular furnace. The deposition temperature was kept at 900°C for all the substrates. Prior to spraying the solution of ferrocene in xylene (0.02 gm/ml) with a glass sprayer, the growth chamber was purged with Ar gas. 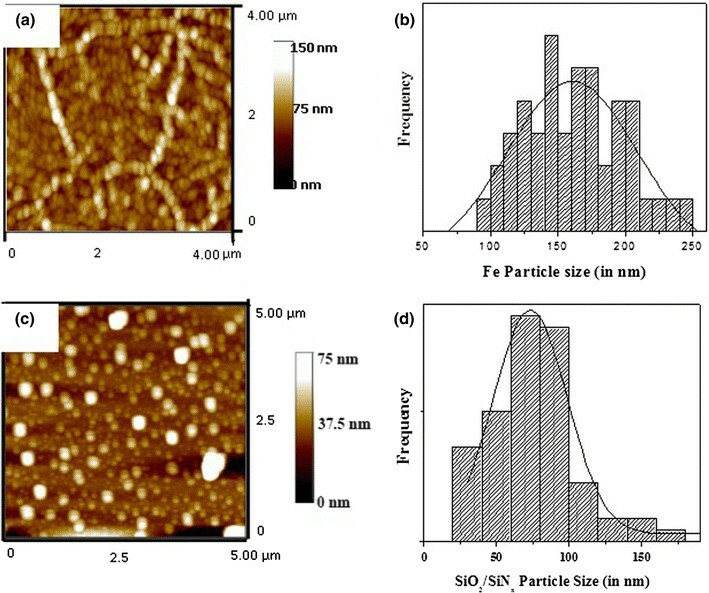 Size distribution of Fe and silicon nitride particles on the silicon wafer was analyzed using atomic force microscope in contact mode (model Nanoscope IIIa, Veeco Metrology Group). The surface morphology, cross section, and growth behavior of the CNT samples were analyzed with scanning electron microscope (SEM: EVO) operated at 30 kV. The microstructure of the samples was analyzed with transmission electron microscope (TEM: Phillips CM 12) and high-resolution TEM (HRTEM: Technai G2, EDAX company USA) operated at 100 and 200 kV, respectively. For TEM and HRTEM, samples were scratched from the substrates, refluxed, ultrasonicated in ethanol, and then transferred on to a carbon-coated copper grid. The AFM image of the Fe and silicon nitride thin film deposited on silicon substrate after pre-heat treatment is shown in Fig. 1. Figure 1b and 1d show the histogram of average particle size distribution of the Fe and silicon nitride clusters, respectively, as calculated from their corresponding AFM images (Fig. 1a, 1c). SEM images of the CNT growth on different substrates are shown in Fig. 2. On silicon oxide, Fe-deposited silicon, silicon nitride-deposited silicon, quartz, Fe-deposited quartz, the CNTs were uniform and vertically aligned. Even though some of the CNTs seemed to be bent, the overall CNT array structure exhibited excellent alignment, perpendicular to the substrate. Such an alignment is considered to be due to the catalyst–surface interaction and the Van der Waal forces between the tubes. In the case of copper, the metal surface appeared to form amorphous carbon in agglomerated form. On the other hand, CNTs grown on stainless steel mesh were highly non-uniform with respect to orientation (‘spaghetti’ like). It is believed that annealing of stainless steel mesh at deposition temperature ruptures its surface creating catalytically active sites for CNT synthesis. All the substrates considered in this work, except untreated silicon and copper, favored the nucleation and growth of CNTs as shown in Table. 1. 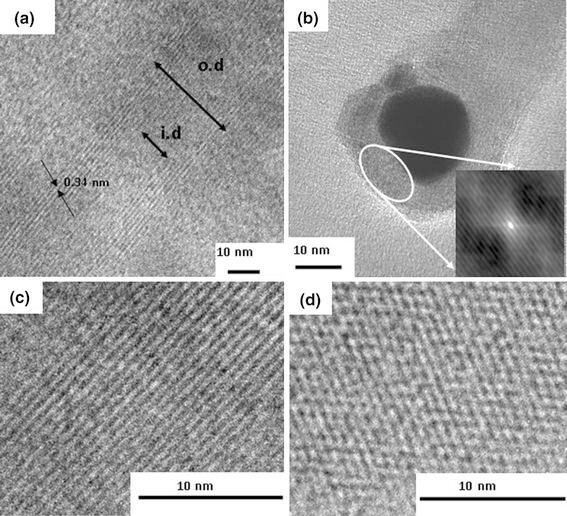 TEM images of CNTs removed from the substrates are shown in Fig. 3. It is evident from all the images that, for all the substrates, CNTs are multi walled with varying diameter. 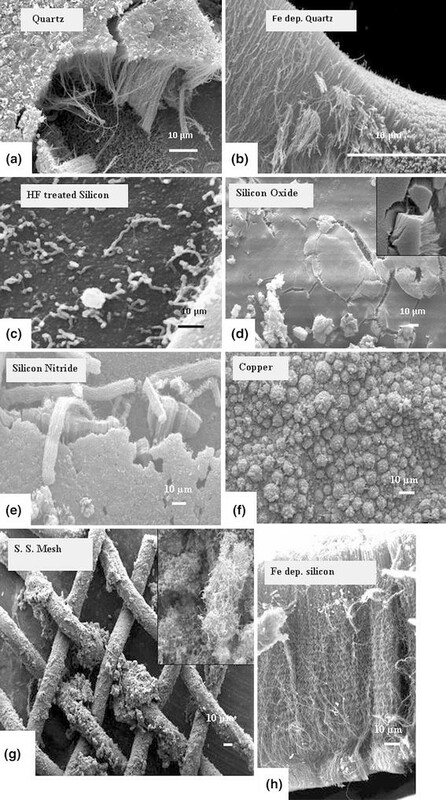 It is observed from SEM and TEM results that growth mechanism for untreated and Fe-deposited substrates is complimentary i.e. for untreated quartz and silicon oxide, growth follows the base growth mechanism, whereas for Fe-deposited quartz and silicon it is the tip growth mechanism. The large number of catalyst nanoparticles trapped inside the CNTs and on their ends (closed) supports the base growth mechanism for bare quartz, silicon oxide, silicon nitride-deposited silicon, and stainless steel (Fig. 3a, 3e, 3f and 3h), whereas catalyst at the end of CNTs verifies the tip growth mechanism for Fe-deposited silicon and Fe-deposited quartz substrates (Fig. 3b, 3d). It can also be inferred from these images that except for stainless steel, CNTs on all other substrates have hollow cavity, whereas stainless steel sample shows a bamboo-like structure. High-resolution TEM (HRTEM) images of CNTs grown on silicon oxide, Fe-deposited silicon, and silicon nitride-deposited silicon are shown in Fig. 4. A high-resolution image of multi-walled CNT grown on silicon oxide showed ~8 to 10 concentric graphene sheets wrapped around a hollow inner core of ~11 nm diameter. A Fe particle enclosed at the end of CNT with around 24–26 graphene planes shows the base growth mechanism for Fe-deposited silicon (Fig. 4b). We believe that the addition of Fe layer plays a crucial role in alignment of CNTs due to the formation of uniform layer of Fe catalyst nano particles on the surface of the substrate . During the CNT growth process, the precursor solution of xylene and ferrocene readily decomposes on the substrates (silicon oxide or well-dispersed catalytic Fe on silicon) resulting in the growth of well-aligned CNT arrays. The alignment of the CNT arrays may be explained based on the “crowding effect” and on Van der Waal interactions, with each CNT being supported by a neighboring CNT. The vertically aligned CNT arrays grown on silicon oxide and Fe-deposited silicon had similar morphologies. The above-mentioned mechanism is applicable to describe the growth of aligned CNTs on most of the substrates used here. However, HF-treated silicon and copper fail to allow the nucleation of CNTs. In the case of copper, we believe that the tendency of copper to alloy with iron (provided by ferrocene) hinders the availability of catalyst for the growth of CNTs. On the other hand on HF-treated silicon, iron silicide formation takes place i.e. Fe provided by the dissociation of precursor solution reacts with the silicon substrate yielding a catalytically inactive FeSi2 phase which prevents the growth of CNTs on this substrate . In addition, silicon nitride layer acts like a diffusion barrier and thus reduces the probability of iron silicide formation between the silicon substrate and the iron catalyst. When this silicon nitride layer is annealed in air, silicon nitride decomposes to crystalline silicon oxide in a matrix of amorphous silicon nitride . In our experiments, the alignment of the CNTs on silicon nitride-deposited silicon substrates could be due to nucleation process catalyzed by Fe on active sites or unsaturated bonds created on silicon nitride clusters (as shown in AFM, Fig. 1b). In the presence of Fe catalyst, silicon nitride clusters efficiently catalyze the continuous synthesis of CNTs. The length of the CNTs on this substrate is around 100–130 μm, whereas on silicon oxide it is around 50–60 μm . The CNTs grown on silicon nitride sample are seen to form bundles, which are well adhered to the substrate. The TEM and HRTEM images of the samples (Figs. 3f, 4c, 4d) and CNTs grown on silicon nitride are highly crystalline, showing all graphene planes are exactly parallel to each other with no defects, and the total number of graphene planes is ~8 to 10 with interplanar distance of ~ 0.338 nm. These results suggest that silicon nitride-coated silicon is very well suited as a substrate for the growth of CNTs. Silicon oxide and silicon nitride are dielectric materials, widely used in semiconductor industry  and hence controlled growth of long vertically aligned CNTs on these substrates can open up new pathways for the futuristic microelectronic devices having hybrid structures of dielectrics and CNT [19, 20]. On the other hand bare and catalyst deposited quartz substrates used for aligned growth of CNTs can find applications in various optical and photonics devices . CNTs grown on the highly conducting copper and stainless steel mesh substrates may find application in field emission devices and super capacitors . From the present study on growth and morphology of CNTs grown on various substrates, it is concluded that quartz, silicon oxide, silicon nitride, and Fe-deposited silicon favored the aligned growth of CNTs, whereas stainless steel resulted in random growth (‘spaghetti’ like). It is also evident that bare silicon and copper do not allow nucleation and growth of CNTs. The silicon nitride-deposited silicon seemed to be the best-suited substrate for long aligned CNTs, which may find application in various nano devices. One of the authors, Sangeeta Handuja is grateful to the Council of Scientific and Industrial Research, Government of India for providing a research fellowship.